Insights from Bernard Charnwut Chan. The Rebalance author Mercy Kuo regularly engages subject-matter experts, policy practitioners and strategic thinkers across the globe for their diverse insights into the U.S. rebalance to Asia. This conversation with Bernard Charnwut Chan – president of Asia Financial Holdings Ltd., Hong Kong deputy to the National People’s Congress of the People’s Republic of China, Executive Council member, chairperson of the Hong Kong Council of Social Service, chairman of The Jockey Club CPS Ltd Advisory Committee, governing board member of the Alibaba Entrepreneurs Fund in Hong Kong, and president of the Hong Kong- Thailand Business Council – is the 48th in “The Rebalance Insight Series”. What is the role of Hong Kong in U.S.-China relations? I think we have to be careful about suggesting that Hong Kong can play an active role as some sort of detached or impartial player. Foreign affairs are constitutionally Beijing’s responsibility. Hong Kong’s value is as an open society and economy. It welcomes American people and companies – they feel very much at home here – and it facilitates closer U.S.-Chinese ties, and hopefully understanding. What is a viable strategy to preserve Hong Kong’s autonomy and rule of law? There is only one way, and that is for everyone to adhere to the basic principles on Hong Kong’s constitutional position – the structures laid out in the Basic Law and the “One Country, Two Systems” principle. That whole framework was designed to accommodate Hong Kong’s very different legal and other systems within broader Chinese sovereignty. There are clearly tensions. Some people in Hong Kong who fear Mainland influence propose extreme things like independence, which Beijing then sees as a threat, and in theory that could spiral. The way out is to go back to the Basic Law and stick to that. During his recent visit to Hong Kong, Beijing senior official Zhang Dejiang specifically mentioned localism and fears of Mainland influence. I think Beijing recognizes local sensitivities about our autonomy and identity. What is the impact of China’s Charity Law on Hong Kong’s civil society? Well, it doesn’t affect Hong Kong directly. Local NGOs and civil society will carry on doing their work here. But Hong Kong charities that work on the Mainland could be affected. I haven’t heard of any examples yet. I think most NGOs are still waiting to see how the new regulations will work in practice. There are concerns about getting their applications approved under the new rules, but let’s see how it goes. How is Hong Kong’s political identity and regional role evolving? Hong Kong’s political identity goes back to what I said about autonomy. To outsiders, Hong Kong’s political debates probably look a bit chaotic, with a lot of squabbling. But this is a very free society, and there are disagreements about all sorts of policy areas. Some small fringe groups grab a lot of attention, but mostly people want the debate to be civilized and constructive. Our regional role is probably linked to this because our unique administrative status is essential to our economic and other ties with other regions. On the one hand, we are clearly constitutionally and geographically a part of China. On the other hand, we have all these cultural and economic links with Southeast Asia, with Western countries, with overseas Chinese, which mainland cities do not really have. Our relationship with the wider Asia-Pacific region reflects that. We serve as a hub – and still in many ways, a gateway – for mainland and foreign people doing business with each other. Companies from all around Asia, Europe and America have a big presence here because of our regional hub status and our Mainland links and expertise. And Mainland Chinese companies are increasingly coming to Hong Kong and using the city as a stepping stone to overseas markets. Hopefully, our regional role will continue to develop to make optimum use of this ability to bring China and the world together. How should the next U.S. president – Democrat or Republican – manage Hong Kong vis-à-vis U.S.-China relations? I would expect the new president to continue to see Hong Kong in the same way as his or her predecessors have. Although there are obvious disputes at times between the U.S. and Beijing, U.S. administrations have been supportive of the Basic Law and “One Country Two Systems” framework. 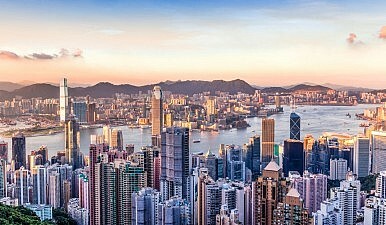 American businesses have a big presence in Hong Kong, and it’s in everyone’s interests for that to continue. As I said at the beginning, that’s how Hong Kong can best help contribute to building a positive U.S.-China relationship. China’s plan for Guangdong-Hong Kong-Macao integration demonstrates the “One Country, Two Systems” model for Taiwan.